Our area here in South Wexford is now rich with talented craftspeople, musicians, makers and foragers - also growers and farmers. Since the addition of a residential space to our Potter's Yard, we have been thinking of ways to offer a taste of the area and its talents to our visitors. At present Ultan and myself are designing exciting 'workshop bundles' which would include accomodation, craft workshops, foraging trips in season and evenings of music or just quiet relaxed dinners in our atmospheric home. If you have a wish to immerse yourself in a 'Hands On' adventure with us do let us know your thoughts and dreams of even a small taste of the good life. We will enjoy hearing from you and endeavour to knit together an engaging and authentic personal experience. A conversion has happened at The Potter's Yard - studio workshop and home to Patricia and Ultan (Men Who Built Britain and McAlpine's Men) It is not exactly a road to Damascus moment, but a very physical conversion of two of our stables into a lovely spacious residential space. Currently we are advertising on airbnb and have had many visitors from all over the world this summer to stay with us. The Jumbo range has emerged organically. I began playing around with the idea of printing on clay near to the beginning of 2012, working with a small group of pottery students we began cutting sponge, thick slabs of upholstery sponge proved to be very useful. I bought finely pointed sharp little craft knives, and had fun cutting into the sponge. At first I cut naturalistic shapes, leaves, butterflies, and flower petals. Using coloured slips I dipped my sponges and pressed the shapes against the clay, squishing, and blotching were my first problems. I learnt how much slip to leave on the sponge before pressing it to the surface of the clay and began to become adept at the technique. Cut to the ellies. I threw about 2 dozen tall mugs, an elegant shape and needed a really lovely motif for the mug. I planned to use a sponge print, and became inspired by the image of an elephant from a collage which I had made yonks ago. So I cut the sponge into the ellie form, pressed it into some black slip and printed it out on a large sheet of paper, my first trial. The shape of the ellie was just right, so the next step was a print onto one of the mugs. I was able to fit two eles, one holding the others tail, as they perambulated around the mug. 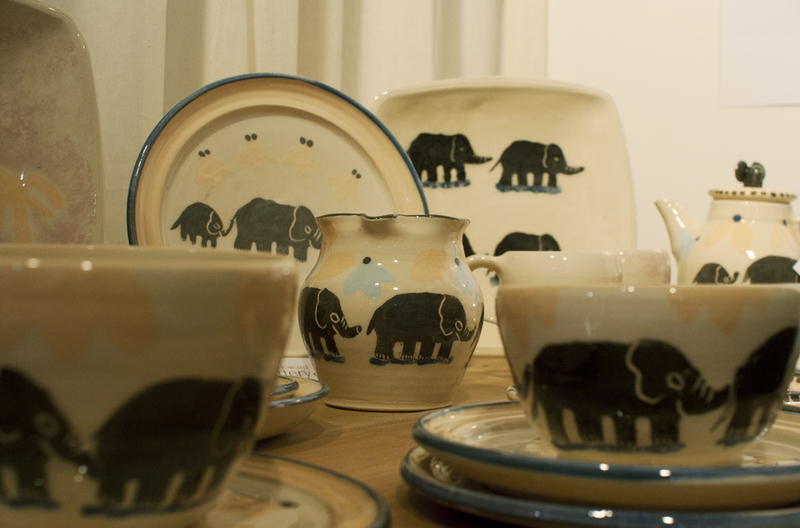 The ellies looked so cheerful, so I threw plates and bowls in quick succession all to be decorated by these amazing creatures. I hope you share my enthusiasm for this new ware from The Potter's Yard, we have already added a biscuit jar with an elephant modelled on top of the lid and a tea pot. The response at Showcase was very encouraging with some orders being placed, you can order online! We had a great time at Showcase Craft Expo last week! So many amazing craft workers to be seen, and it's a credit to the organisers who put in such hard work to make it happen. It was the first outing for our new Jumbo Range as well - doesn't it look great?! Shop online or enroll in a workshop.